Throughout Arkansas, our highways, byways and back roads lead to some of the best eats in the South. In February, the 3-year-old Arkansas Food Hall of Fame announced this year’s top food destinations. With this new batch of tantalizing must-try tastes to explore, it fell to me to write about the winners — and doing right by our readers required considerable sampling of these award-winning foods. (This, as you might imagine, was not a hard story to accept.) I’m happy to confirm they’re worth celebrating. First, let’s explain the awards. Last fall, 650 online nominations from Arkansans poured in from every county in the state — hundreds more nominations than previous years. The Arkansas Food Hall of Fame, a project of the Department of Arkansas Heritage, annually inducts three classic Arkansas eateries into the Hall of Fame and names winners in four additional categories. The Food Hall of Fame committee, comprised of 13 culinary experts from around the state, culled the list down to the finalists, announced in January. A “blue-ribbon panel” of judges then evaluated the finalists. 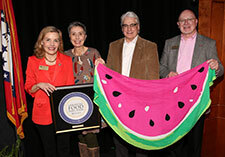 On Feb. 25, Rex Nelson, committe member and author of Southern Fried Blog, emceed a packed house at Ron Robinson Theater in Little Rock, telling the story of each finalist before announcing the winners. It was an entertaining evening that kicked off my highly enjoyable research project seeking out these top Arkansas eating experiences. Read about them here, then hit the road to try them yourself! 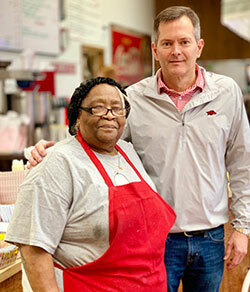 Louise Ferguson, better known as “Mama,” with owner Jeff Voyles. Alden Burge opened the original Burge’s in Lewisville in 1962 and its sister location in the Heights neighborhood of Little Rock in 1974. 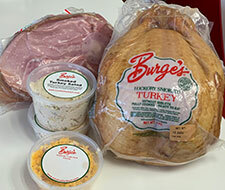 There’s a good chance you’ve at least heard of Burge’s famous hickory-smoked turkeys, hams and chickens, available by mail-order all year. During the last two months of the year, they annually ship about 16,000 items to all 50 states, said owner Jeff Voyles, who bought the business from the Burge family 10 years ago. Burge’s is best known for its smoked meats, shipping 16,000 orders nationwide during the holidays alone. Vast and varied, Burge’s menu stretches across 25 feet of menu boards and banners. The smoked meats are a big seller, as are Burge’s creamy smoked turkey salad spread and the goopy, melty deliciousness of the Smoked Turkey Melt. Burge’s is also known for its farm-raised catfish, and for sandwiches, sides and fried pies. They have the best (and by far the cherriest) fresh-squeezed cherry limeade you’re likely to find anywhere. The Lewisville location also serves fresh-smoked chicken plates and ice cream sundaes. Voyles said the staff are an essential part of the laid-back, welcoming Burge’s atmosphere, rattling off a list of employees who have worked there more than 10 years. The undisputed queen of the kitchen, though, is Louise Ferguson, better known as “Mama,” who has been cooking up Burge’s meals for 39 years. Voyles said she’s a cooking genius. 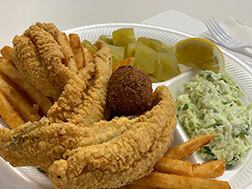 Burge’s catfish platter features farm-raised Mississippi catfish, original recipe slaw and hushpuppies, tangy green tomatoes and beer-battered fries. 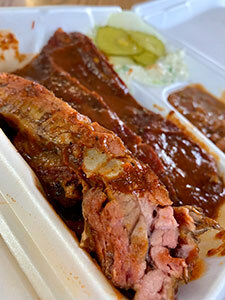 Every barbecue tour of The Natural State makes a swing by DeValls Bluff for Craig’s. The original Craig Brothers were Lawrence and Leslie Craig, later joined in the business by their brother, Wes. They opened their barbecue joint in 1947 in their hometown of DeValls Bluff. The Craig family now co-owns the restaurant with family friends Jerry and Joyce Surratt, who have managed daily operations for almost 40 years. 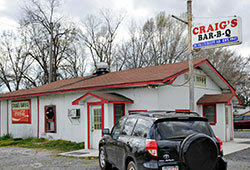 Craig’s is one of those Arkansas gems that seems to exist outside of time, resisting the pressures of modernization. The barbecue is the star, and word-of-mouth advertising has worked for generations, bringing people from all over the nation. Craig’s rib plate is worth the drive. Try the famous sauce in mild, medium or hot; they’re all great. Craig’s smokes its choice cuts of pork and beef in the smokehouse out back for 8-10 hours, caramelizing the meat in all the right places and infusing it with a robust hickory smokiness. The pork is the most popular and comes sliced (we’re told that’s the best), chopped or as thick, juicy ribs. Pair that with the Craigs’ signature sauce — a bold, complex mustard sauce with hints of peppers cut by a soft apple flavor — and you have a taste that’ll bring people back for at least 72 years. It’s savory and spiced, not a sweet molasses or honey sauce like most Arkansas barbecue is, so it can be an acquired taste. For a sweet finish, be sure to order a wedge of the homemade pie from the town’s Family Pie Shop. Craig’s is cash-only, and the few inside tables are often filled with customers eagerly awaiting their takeout, so it never hurts to call ahead. 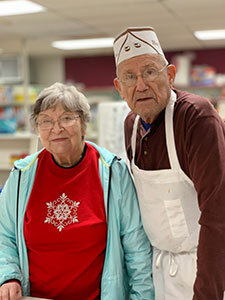 Owners Maureen and Charles “CK” Keeney opened their business in 1956. When Charles “CK” Keeney opened the neighborhood grocery store at the corner of Malvern’s Dyer and West Mill streets in 1956, there were 26 other such grocery stores in town, one about every six blocks, he said. Keeney set to making his an essential stop for locals, and with his wife, Maureen, built a successful store for the next 40 years, outlasting most of his competition. About 20 years ago, as shopping habits changed, he decided people needed a new reason to stop by Keeney’s. 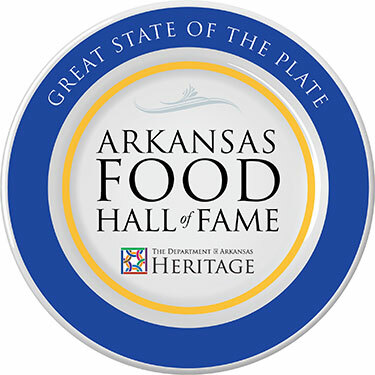 Other Arkansas Food Hall of Fame finalists: AQ Chicken House of Springdale; 4-Dice Restaurant of Fordyce; Bruno’s Little Italy of Little Rock; Doe’s Eat Place of Little Rock; Kream Kastle of Blytheville; The Ohio Club of Hot Springs; and Star of India of Little Rock. 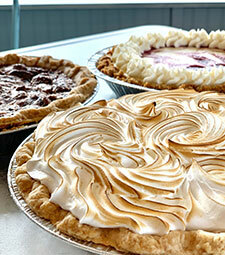 Honey Pies’ creamy peanut butter pie with chocolate ganache and the coconut meringue pie are among the best-sellers. nominations wins. Although it’s a relative newcomer on the restaurant scene, in the four years since it opened in West Little Rock, Honey Pies has developed a devoted following. Owner Sharon Woodson and Executive Pastry Chef Ann Wood make gorgeous desserts that taste even better than they look. They are sourced from local ingredients as much as possible, no artificial flavors or preservatives added. Woodson said the desserts are still hand-mixed like her grandmother taught her. The cafe also has a small breakfast and lunch menu and an array of coffees to accompany the award-winning pie. Rich and chocolatey with a dense, gooey filling, the chocolate fudge brownie pie is the top seller. Even better, a take-and-bake freezer is filled with pies, quiches and crusts to use at home. With more nominations than any other restaurant in the state, it’s a good bet you’ll love it, too. Loretta Tacker’s warm smile is the first thing that gets you. Arkansas’ Proprietor of the Year has been “proprietoring” for 42 years now, and is preparing this spring to expand her iconic Marion restaurant into a brand-new, much larger building on the same lot. The Shake Shack, Marion’s first restaurant, remains the town’s most popular. Loretta and her late husband, “Big John,” turned their mom and pop restaurant into an eatery with customers from across the world. While the food is legitimately terrific, her son Jeff Tacker says a lot of that popularity has to do with the sense of community Loretta has fostered over the decades. She knows her customers, knows who loves which dishes and asks after anyone who hasn’t darkened the doors in a while. Three generations of Tackers now run the restaurant, and the cowbell John Tacker affixed to the front door still rings out, welcoming every arrival. Loretta’s creations have been included in several books and “best” lists. Her bread pudding recipe was featured in a Southern Living cookbook. Among the dozens of menu items, she’s proud her grandson’s gourmet hamburgers are now the stars of the menu. 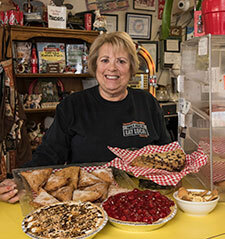 Loretta says the Tang Pie is a customer favorite, and her Hot Fudge Pie was named by a Memphis TV outlet as one of the five best desserts in the mid-South. Elvis and Coca-Cola memorabilia decorate the restaurant, but one wall is dedicated to two maps of customers’ points of origin. One map is of the U.S., the other of the world. Both are peppered with pins, the U.S. map basically a solid mass of pushpins covering every state. Surrounding the maps are cards and notes people have left with thanks and well-wishes, many written on napkins. It’s the sort of place where people want to do that. 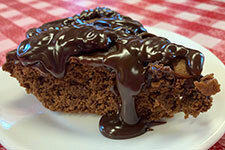 Memphis’ WMC-TV named Shake Shack’s Hot Fudge Pie as one of the best desserts in the mid-South. Other Proprietor of the Year finalists: Capi Peck of Little Rock; Peter Brave of Little Rock; Sami Lal of Little Rock; and Scott McGehee of Little Rock. roots are in one-day celebrations in the 1920s that were popular until the Great Depression curtailed the festivities. Beckie Moore, executive director of the Hope-Hempstead County Chamber of Commerce, said the festival, revived in 1977, quickly became one of the biggest events in the southwest part of the state. Helping cement Hope’s reputation for great watermelons, was C.M. “Pod” Rogers, a longtime circulation manager of the Hope Star, who took it upon himself to circulate word of Hope’s sweet melons by getting them featured on national television shows like The Glen Campbell Goodtime Hour, The Smothers Brothers Comedy Hour and Let’s Make a Deal. Their reputation stuck. 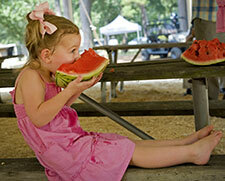 For 43 years, thousands of people have driven into Hope annually to enjoy the watermelon and the surrounding festival. Ice-cold Hope watermelon is sold by the slice, and the melon-themed traditions include the famous watermelon-eating and seed-spitting contests, Watermelon Idol, Watermelon Olympics and Watermelon Waddle Duck Races. The festival schedules dozens more activities, an expansive Arts and Crafts Fair, a 5K run, car and dog shows, pro wrestling and live entertainment. The food extends beyond watermelon to all the classic down-home tastes of summer. Other Best Food-Themed Event finalists: International Greek Food Festival (Pulaski County); Our Lady of the Lake Church’s Annual Spaghetti Dinner (Chicot County); Tontitown Grape Festival (Washington County); and World Championship Duck Gumbo Cookoff (Arkansas County). as a kid. Ask another person, and they’ll rave about the pastries, or the sugar cookies, or the jalapeño cheese bread. For others it was the exquisitely decorated cakes or Norman’s huge, fresh-from-the-oven cinnamon rolls, or the gingerbread that was served in restaurants as far away as New York. Everyone who discovered Klappenbach’s Bakery in Fordyce has a lasting sense memory of their favorite item — assuming they can choose just one. Norman Klappenbach studied with European chefs while serving abroad, then at a top Michigan culinary school. After a career on the West Coast, Norman and his wife, Lee, moved to Lee’s hometown of Kingsland, opening the bakery in 1975 in nearby Fordyce. The level of talent the couple brought to south Arkansas quickly set it apart as a destination bakery. The Klappenbachs closed the bakery in 2011 when Lee was 77 and Norman was 80, when they weren’t able to find an experienced assistant baker. 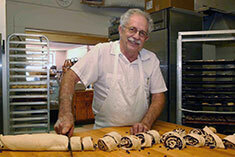 Rather than watch the bakery’s quality deteriorate, after 36 years they opted to close. Other Gone, But Not Forgotten finalists: Mary Maestri’s Italiano Grillroom of Springdale; La Scala Italian Restaurant of Little Rock; Uncle John’s of Crawfordsville; and The Shack Barbecue of Little Rock. For more information, visit arkansasheritage.com/Food-Hall-Of-Fame.